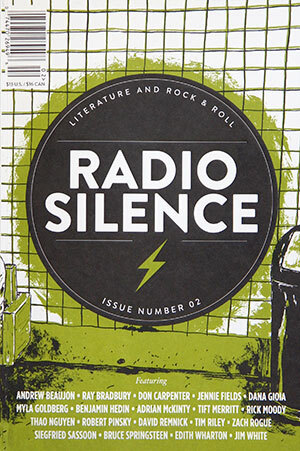 Radio Silence, a new magazine of literature and rock & roll, has released its highly anticipated second issue -- a journal that'll appeal to any semi-lettered rock fan and of particular interest this time around to Bruce Springsteen fans. Issue #2 includes, for the first time anywhere, a transcript of Bruce's lively 2010 conversation with U.S. Poet Laureate Robert Pinsky. With John Wesley Harding serving as moderator, Springsteen and Pinsky had this unique meeting of the minds at Fairleigh Dickinson University's Words and Music Fest on May 6, 2010. The "Jersey Rain" event was an fascinating summit of two great Garden State writers, but one that was only experienced by a small auditorium's capacity crowd. Now you can read it here. 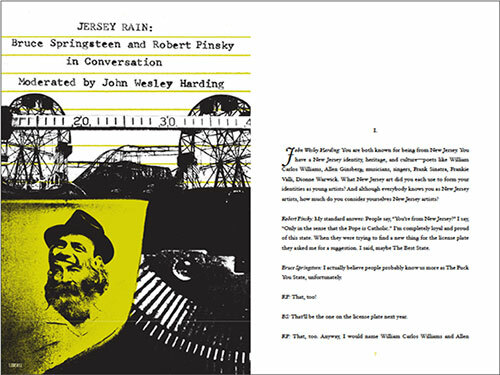 In all, 215 pages of essays, interviews, fiction, poetry, and illustrations by contributors including Rick Moody (on Sleater-Kinney), David Remnick (on Bob Dylan), Tim Riley (on Woody Guthrie and Billy Bragg), Myla Goldberg ("Confessions of a 21st-Century Phonographile"), Ray Bradbury, Tift Merrit, and others. Highly recommended.